This morning, the chaperones met our students at school. We checked in with all of them to see how their first night with the host family went. They were all content. Some of them mentioned how the host family was going out of their way to do everything for them. Our students are not used to this part of Chinese culture, and they sometimes feel uncomfortable with the extreme generosity. 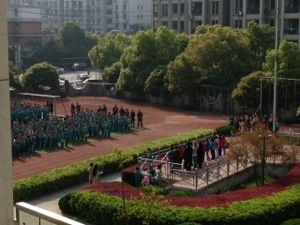 We saw how in China, school begins with morning assembly outside. The students line up in perfect lines by class. There are announcements and songs, they salute the flag while raising it, and they acknowledge the students of the week from each class. They introduced our group, and each child in our group said his or her name. It was evident that the Chinese students were excited that we were here. Our students spent the morning in class with their host siblings, participating in various different classes and activities. 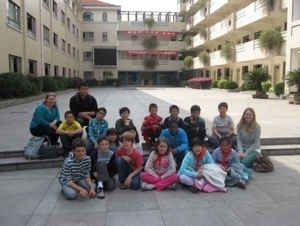 After lunch, we took our group to visit two of the other campuses of the Qiushi school. There are four different campuses overall. The size of the campuses was impressive! During our afternoon time together, we continued to check in with the students and ask about their day. 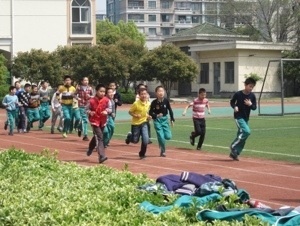 At the last campus, they even had some time for recess, and most of our boys played an intense game of basketball against some Chinese boys. They had a great time playing together! This seems to be the toughest day for our children with fatigue and homesickness, but they are all healthy and having fun and were reassured by our presence on campus today. Tonight the chaperones will visit a selection of host families to enjoy some time with the families and our students.